I will admit I have really been excited since the Apple Watch announcement to get a smart watch on my wrist to make my life easier. I was a little envious of my Android friends that already had smart watches. I didn't care that they looked clunky or cheesy. I just wanted access to data quickly on my wrist. 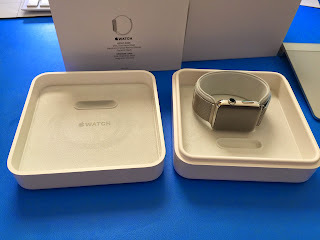 I eagerly ordered my watch on April 10th and hoped it would arrive on April 24th and to my delight it did come on Friday April 24th at 1:40 in the afternoon. 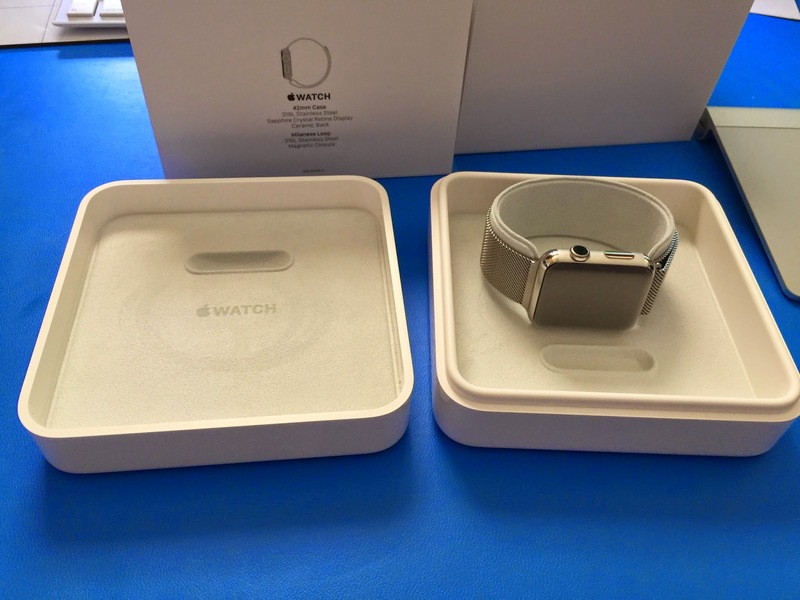 By 2:15 I had it unboxed, paired to my phone and begun the task of configuring my watch. Setup was pretty easy and after asking it to mirror my iPhone for preferences I just had to wait for apps to install and the watch to be completely ready but I could wear it in the mean time. 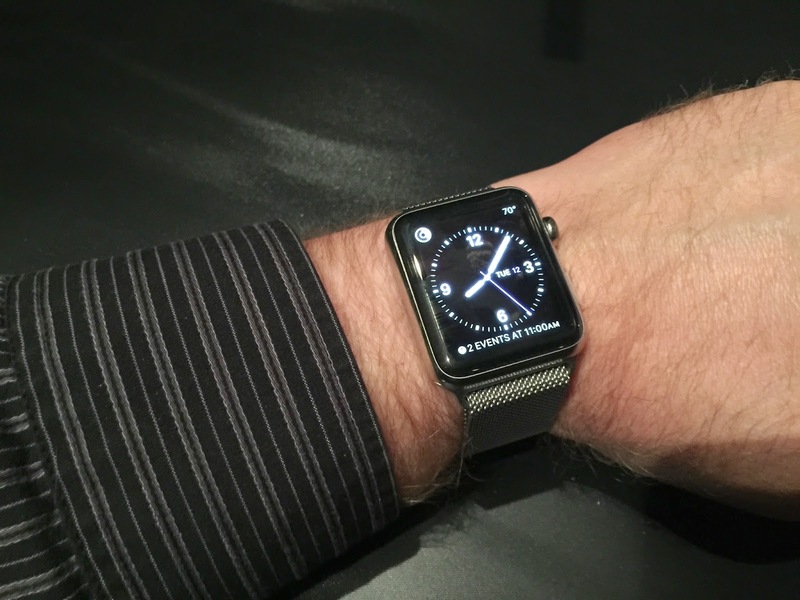 I thought the look didn't matter but after slipping the stainless steel watch with milanese loop on my wrist I realized the look does matter. For the most part my watch goes largely unnoticed looking like a normal but somewhat large watch. When it gets attention is when I do something that a watch doesn't do and even a Android watch still lacks. Paying for purchases at the store with Apple Pay, or answering my phone when my phone isn't in easy reach just to name a couple of examples. I'm sure there is more that I do with it but it has become so enmeshed with my daily life I am already starting to not think about it. I just put it on as soon as I get out of bed and wear it until I am ready to go to sleep. The battery life is even better than expected. I have gone past 18 hours of using my watch and still had 25% of my battery left to spare. I haven't needed to use the Power Reserve Mode yet after two weeks of heavy use and charging nightly. A few things I found surprising in the watch was the ability to Ping my phone when I leave it somewhere. Something I do quiet a bit at home and in the office. Although less now that my phone doesn't leave my pocket nearly as much during the day. The phone and watch also mirror each other in Do Not Disturb and Airplane modes. Of course once you put it in airplane mode you will need to access both devices to get them out of airplane mode. The watch faces are delightful and while there are not many of them, they are all customizable and all look good. Mickey faces opposite directions in the morning and in the evening. The animations for the moon and the planets are very smooth and rolling the digital crown can show where the planets will be or were on a given date. As for the things I am not crazy about, the load times for third party apps is quiet long. I am sure it is to preserve the battery life but wouldn't it benefit battery life more to load quickly so I can get back to whatever else I might want to be doing? I wish there was a setting to allow the user to set how long the watch face stays active when it is being viewed and to be a little more lenient when I put my arm down or change position to not think I have turned away and turn off the screen immediately. I wish the sensors on the watch did more. After seeing the new Jawbone UP 3 having temperature sensors to measure both ambient and skin temperature. As well as a bioimpedance sensor which could be cool add ons for the quantified self. I want my watch to tell me when I am getting stressed and encourage me to call down a bit. The things we don't know yet, will it be upgradable? I would love to see an Apple watch update program which would make sense for the price point and peoples tendency to keep watches. I know as Apple develops the watches they will get thinner and they styling will be enhanced. It would be great if people who wanted the new style could just buy a new watch but people who like the style they have be able to upgrade the internals when a faster CPU, more memory, improved battery, or more sensors become available. The OLED display is absolutely beautiful and is easy to read in bright light. The watch fit and finish feels like a very high quality and something I could wear for a long time to come. Overall it is a beautiful watch with a lot to like. Now that it is getting into the hands of developers something that is already useful is going to go crazy with possibilities. As time goes on Apple will loosen the reigns a bit and let developers take the watch even further. The Apple watch was an excellent 1.0 device from Apple and I am excited to see where it goes in the future and how it will tie in with HomeKit and other future Apple technologies.